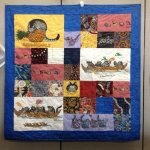 This class will give you hands-on exercises in cutting, stabilizing and preparing t-shirts for quilts as well as assembling the quilt. We will discuss choosing t-shirts, background fabric, layouts and themes. The instructor, Betsie Spann, has been quilting for 15 years and made 10+ t-shirt projects. Minimum enrollment = 3. Class may be cancelled (with refund) if minimum enrollment is not met. Cancellation policy: 100% refund with greater than one week notice; 20% refund with greater than 24 hours notice.